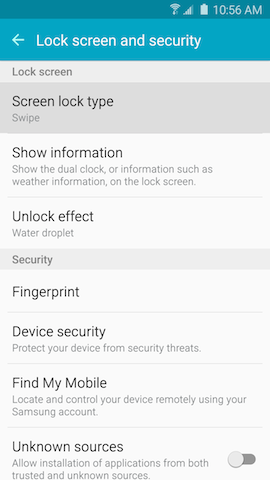 Galaxy S6: How do I add a Fingerprint Lock on my Samsung Galaxy S6? 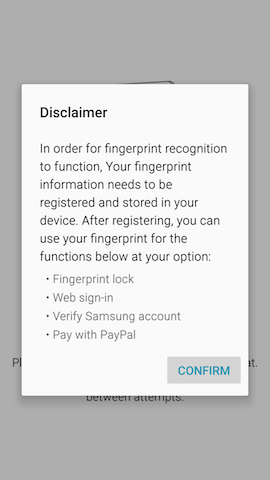 Use fingerprint recognition as an alternative to entering passwords in certain apps. 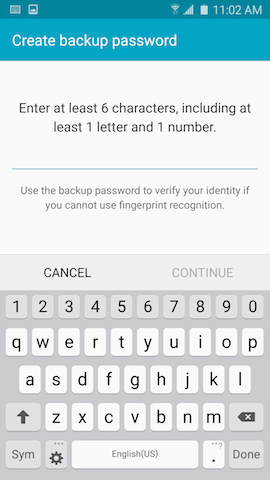 You can also use your fingerprint to verify your identity when logging in to your Samsung account. Increase your mobile device's security by creating a fingerprint lock. When Fingerprints lock is enabled, you must touch your finger to the Home key to access your device. 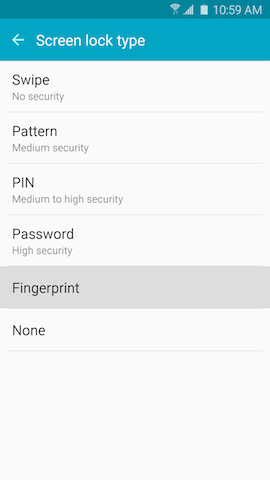 Note: Fingerprint recognition uses the unique characteristics of each fingerprint to enhance the security of your device. The likelihood of the fingerprint sensor confusing even small areas of two different fingerprints is very low. But, in rare cases the sensor may recognize a fingerprint that is similar to a registered fingerprint. Note: It may be necessary to scroll down and touch Lock screen and security under the Personal tab. Note: If you have previously set up a different type of lock, you may be required to enter your credentials. 6. Review the disclaimer and touch CONFIRM. 7. Touch your finger to the Home key and lift it. Repeat until the indicator reaches 100%. Note: To ensure your whole fingerprint is recorded, move your finger slightly each time you touch the key, fully covering the key with your finger. 8. Create a backup password and touch CONTINUE. 9. Retype the password to confirm it and touch OK.
10. Choose whether to show notifications with content, without content, or not at all. For this example, touch Show content and touch DONE. 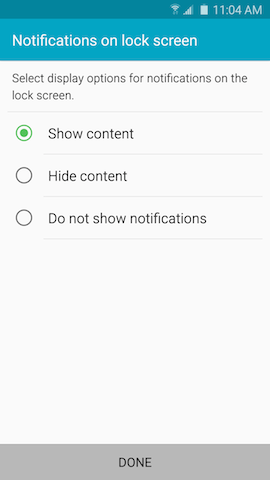 Note: Adjust this setting at any time in Apps > Settings > Sounds and notifications > Notifications on lock screen. 11. Fingerprints lock is now enabled. To lock the device, press the Power/Lock key. 12. Press the Power/Lock key to show the lock screen. 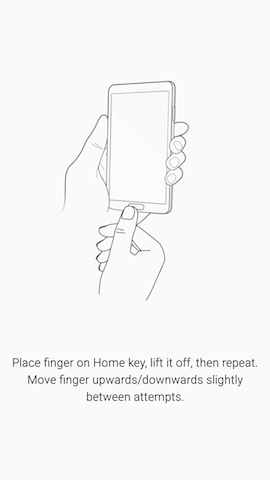 Then touch your registered finger to the Home key to unlock your device. 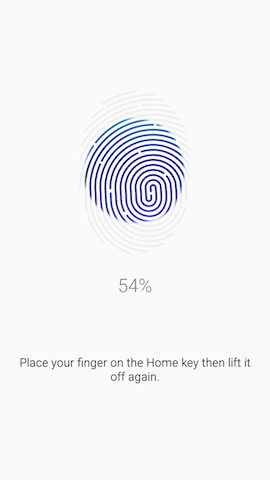 Note: You will have a maximum of five attempts to unlock your device using your registered fingerprint before being asked to enter your backup password. 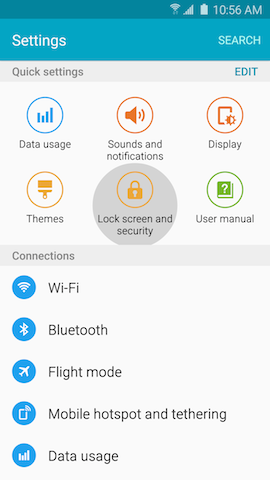 Galaxy S6: How do I pin applications to the screen on my Samsung Galaxy S6? 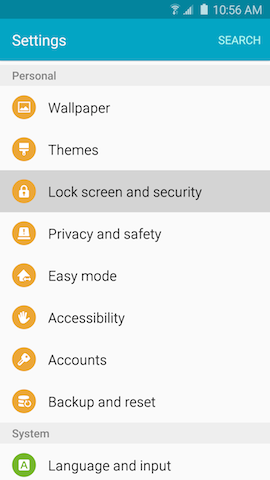 I locked my Galaxy S6 and unlocked automatically without using a screen lock type. 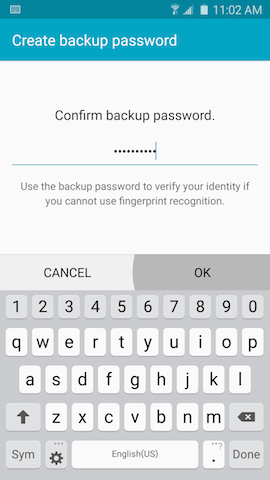 Galaxy S6: How can I manage my Fingerprint Locks on my Samsung Galaxy S6?